At the initiatives and efforts of ALL INDIA UCO BANK EMPLOYEES' FEDERATION, all India convention of UCO Bank Young Employees was held at Chennai on 15th and 16th August, 2015 . As many as 390 comrades from all the States excepting North Eastern, Goa and Orissa participated in the Convention. 107 woman comrades were part of the delegation. 18 comrades from different states including 5 women comrades participated in the deliberations and spoke on issues pertaining to Bank, Service conditions, ongoing struggle against Banking Sector Reforms , Strengthening of Trade union, etc. More than 20 comrades both male and female from the host unit presented very innovative, exciting and entertaining cultural Programme displaying their talents. Excellent display of Discipline, Dedication and Devotion by the participants whose attendance in all sessions of the convention was total and with full of enthusiasm. The day's schedule commenced with hoisting of National Flag and AIBEA Flag sharp at 9.00 am as scheduled. Com. C.M. Patel, General Secretary of our Federation hoisted the National Flag and greeted the gathering, the occasion being India's 69th Independence Day. Com. Chitra, the youngest comrade who joined the Bank on 25/6/2015 hoisted the Flag of our National Organisation - AIBEA amidst thunderous slogans AIBEA - ZINDABAD, AIBEA -LONG LIVE, AIBEA- MARCH ON renting the air. Dot at 9.45 am, the INAUGURAL SESSION was commenced in the hall which is named after Dr. A.P.J.ABDUL KALAM with a prayer song dedicated to the Mother of Tamil. The gathering at the outset observed two minutes silence as a mark of respect to the great soul of Dr. ABDUL KALAM who all through his life endeavored himself to inspire and motivate the YOUTH of the country towards achieving their dreams. This was followed by visual presentation of Dr. Kalam’s message to the youth. Com. Sandhya, another young comrade from TAMILNADU delivered the Welcome address. Com. C. M. Patel, General Secretary of AIUCBEF in his introductory speech, explained the back ground in which Federation decided to organise the convention, aim and objectives of it and expressed confidence that Federation's efforts would go a long way in galvanizing the future of our Organisation with the involvement of young comrades who are coming into the Bank in large number. One of the leading Institutes in the country delivered Inaugural Address. In his one hour long speech, he laid emphasis that India has a vast asset in the youth of the country compared to any other country in the world and hence Youth need to play their role in the development of the country, in the upliftment of the downtrodden in the society. He called upon the youth to be morally upright, mentally strong, intellectually bright, socially conscious so as to fight against injustice and fight for poverty-free India. At the end he read out some advices of Dr. Kalam and administered a pledge on the participants. In the absence of Shri. Charan Singh, Executive Director of our Bank who could not come due to indisposition, Shri. S. P. Singh, General Manager, Personnel Services Department attended the convention as our chief guest. While greeting the convention, he expressed his confidence that the unions will fight against P. J. Naik COMMITTEE recommendations which are detrimental to the interest of Public Sector Banks. He assured that management would address all genuine concerns of the employees. Shri. Mallikarjuna, General Manager, Chennai circle greeted the convention with his compliments to the employees for their proactive role in the development of the Bank and expressed his hope that the young employees would take the bank to newer heights. Com. Arunachalam Treasurer of AIBEA, Com.Vijaya Kumar, Assistant Secretary AIBEA, Com.S.Roy Choudhry, General Secretary of AIUCBOF greeted the gathering. Com. C.H.Venkatachalam, General Secretary of AIBEA, in his 105 minutes long inspiring speech first complemented and congratulated ALL INDIA UCO BANK EMPLOYEES' FEDERATION for taking the initiative of Organising such a convention which is unique and in tune with the thinking of AIBEA, setting a trend for other Bank unions. HE also expressed his happiness over the enthusiastic participation of large number of Young employees. Explaining in detail about the misdirected policies of the Government, particularly in respect of Banking Sector, he called upon the members to be alive to the situation and get ready to fight against. He further cautioned that the move of the government in amending labour laws in FAVOUR of employers is dangerous and will take away all protection available to workers like us today. Hence the strike on 2nd September called by the Central trade unions is more relevant to Bank employees looking to the threat of privatisation, merger of banks, threat to jobs and job security. He wanted the younger ones to involve in the Organisational activities and come forward to take responsibilities in the Organisation keeping in view the need for continued struggle be it for our own service conditions, be it for protecting our own jobs, be it to defend Nationalisation or be it to save the Institutions. He complemented Com. Jaikrishnan, young comrade of TAMILNADU for his commendable contribution enabling AIBEA to launch Mobile Application which is first of its kind for any trade union in the Country. 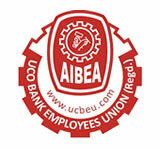 He expressed confidence that UCO Comrades would always be in the forefront of our movement and strengthen AIUCBEF and in turn AIBEA. Com. Jaikrishnan was then felicitated for all his contributions both to AIBEA and AIUCBEF. Inaugural Session came to end with Com. Partha CHANDA, Secretary of AIUCBEF having delivered vote of thanks. A Power Point Presentation was made to enlighten the participants about the Service conditions prevailing in the Industry arising out of Bipartite Settlements. Com.Karthika Sounderrajan, comrade from TAMILNADU who joined the Bank just on 25th June initiated the Presentation with her understanding of benefits flown out of 10th BP Settlement. Com. VIJAYAL, joint secretary of AIUCBEF, then explained how from the era of TRIBUNALISATION, when the service conditions of Bank employees were decided by third party intervention to the era of BIPARTISM through which the service conditions are decided through direct negotiations between unions and Bankers. Service conditions obtained in 1950s, how AIBEA fought for BIPARTISM , how the service conditions were being improved through Bipartite settlements, challenges faced, struggles undertaken, sacrifices made by our leaders etc . In the interactive session that followed clarifications were given on issues raised by the participants. Then a presentation was made on the 69 years of Journey of our National Organisation AIBEA. This presentation helped the participants to understand as to how bank employees of 1950s and 60s had struggled and sacrificed to defend themselves, how the founding fathers like Com. Prabatkar, Com. Parwana and several others courageously formed AIBEA in 1946 and how there after the self esteem and service conditions of employees were transformed, how AIBEA fought for Nationalisation, fruits of Nationalisation, role of AIBEA not only in improving the service conditions of employees and also in improving health of Banks, in defending the Nationalisation against attempts of Government in diluting the Character of PSU banks, how and why AIBEA has to be in the forefront of battle field against various anti people policies of the Government, above all Challenges, threats and tasks before the employees etc. Participants were so enthused, they expressed in loud voice to carry forward the struggle and take the flag of AIBEA to newer heights. In the evening variety entertainment PROGRAMMES were given. The jam packed hall enjoyed till the end which lasted for nearly three hours. Programmes were quite innovative that enthralled the audience. Participants too were involved in different segments. The cultural committee comprising of young comrades both men and women of TAMILNADU held the participants spellbound by displaying variety of talents. Every part of the Programme was responded with loud applause. All in the house heaped praises on the comrades who performed on the Dias. Kudos and compliments to Talented Comrades of TAMILNADU. 9.45 am: Health is Wealth - a Programme demonstrating simple Yogic Exercise that would help reducing the stress was Organised with the help of Shri.Saravanan, a well known Yoga Master in Chennai. 10.30 am: Power point presentation on various staff welfare measures available in our Bank at the efforts of AIUCBEF was made by Com.S.Madhavan, joint secretary of AIUCBEF He elaborately dealt with various privileges, staff loans for various purposes and numerous staff welfare Schemes under staff welfare fund, available to the employees. This presentation was rightly initiated by an young comrade, Kavithalayan who expressed his excitement over getting many of these benefits even within a year of his joining. Followed by the above, Com. Vijayal made a Ppt presentation on the Journey of UCO Bank. This enlightened the participants how the Bank came into existence in 1943, how the Bank was placed in the pre Nationalisation period, the crises faced by the Bank from time to time till the end of 1990s, how the Bank faced the threat of closure and how it came out of the crises after a strategic revival plan drawn up -steered by our Federation, Bank's expansion etc. Joining Com. Vijayal, Com. Partha CHANDA, Secretary of AIUCBEF, who is also presently on the Board of the Bank listed out the details relating to current performance of the Bank, it's achievements in various areas, it's strengths and weakness and the role of workmen staff to further strengthen the Bank's bottom-line, customer service, need for adequate CASA deposits mobilization and increasing the portfolio of retail lending etc. Taking over from them, Com Vijhayan made a detailed presentation on the 52 glorious years of journey of ALL INDIA UCO BANK EMPLOYEES' FEDERATION. From the birth of units in different states how the unfair promotions, unregulated recruitments and the hostile attitude of the Management provoked the leaders of various state units to form the All India Body ( AIUCBEF), struggles Undertaken to bring about fair Promotion Policy, Recruitment Policy, Transfer Policy etc, how the challenges and threats in various periods were combated, how the attempts of disruptions were defeated, the achievements like staff welfare measures , improvements in service conditions secured from time to time through struggles , role of AIUCBEF in defense and development of Bank etc were highlighted during the presentation. Com. C.M. Patel General Secretary narrated how AIUCBEF had to intervene when the Bank was in deep crises and faced the threat of closure in late 1990s and led the Revival efforts and the Success of the revival plan that restored the Bank to a sound position. Com. Antani our Vice President placed a brief account of the struggle undertaken by Gujarat Unit during the period of revival plan against the Severe attack subjecting several of our members to dismissals, suspensions and charge sheets and how Federation came out with flying colors forcing the management to withdraw all punitive measures. Com. H. S.Veer our leader from Punjab narrated the Federation's able handling of a situation that prevailed similar to Gujarat in Punjab zone during the same period. Thus the Long History of AIUCBEF and its present strength, being the sole bargaining power in UCO Bank, it's continued endeavor in the welfare of workmen staff in the Bank, made inspiring and enthusing impact on the participants. As the concluding part of the presentations, Shri. Har Govind Sachdeva, Bank's Chief Vigilance Officer made an hour long presentation on the "DOs & DON'Ts" so as to PROTECT THE BANK AND SELF. Citing some interesting stories he called upon the participants to strictly adhere to systems and procedures, be an upright and dedicated employee so that they, not only protect themselves but also protect the interest of the Bank from undesirable situations. This too was educative and well received by the participants. In the afternoon, in the General Session, the Leaders of AIUCBEF from various states were introduced. In the deliberations 18 young comrades from different states spoke. Besides seeking clarifications on some staff related matters, placing suggestions for further strengthening the Trade Union movement, they all expressed their overwhelming spirit and feelings over the opportunity provided to the young comrades through the convention and thanked the Federation. They shared their happiness and satisfaction over the content and conduct of the entire convention, arrangements made for the convention and appreciated the HOSPITALITY of the TAMILNADU unit. Com. C. M. Patel, General Secretary, responding to the deliberations, clarified on the issues raised. He assured that Federation would escalate its efforts in fulfilling the aspirations and expectations of the employees in the days to come. President Com. Vijhayan then thanked the interest shown by the delegates, discipline maintained during both the days of the CONVENTION, cooperation rendered by them to the host unit and complimented all for their contribution to the SUCCESS OF THE CONVENTION. He expressed that the response shown by the young comrades, representing from all over India, their dedication and attachment have ENHANCED CONFIDENCE AND INFUSED NEW ENERGY IN THE LEADERS, thus serving the PURPOSE AND OBJECTIVE OF THE CONVENTION. Com. E. Arunachalam, Treasurer of AIBEA and General Secretary of Tamilnadu Bank Employees' Federation in his valedictory address congratulated AIUCBEF for Organising such a historic CONVENTION. He recalled the role and contributions of Leaders of the past, particularly like Com. Prabat KAR, Parwana and the respect and recognition that AIBEA has earned at the International level. He called upon the young comrades to understand the contributions of AIBEA both to the Banking sector and to the workforce and remain committed to preserve the values established by AIBEA. Leaders of AIUCBEF, then spoke, profusely thanking and complimenting the leaders and members of TAMILNADU Unit for their strenuous efforts in making comfortable arrangements, providing a conducive environment, displaying wonderful hospitality and thus making the CONVENTION A MEMORABLE AND SUCCESSFUL ONE. At the end, Federation Leaders honoured all those involved in the big task of hosting the grand CONVENTION. THE ENTIRE HOUSE GAVE A STANDING OVATION TO THE COMRADES OF TAMILNADU. With slogans of "THREE CHEERS to TAMILNADU UNIT" renting the air for several minutes the CONVENTION came to an end. ABOVE ALL, OUR COMRADES OF TAMILNADU FOR THEIR HUGE ORGANISING AND HOSTING ABILITY &ONE ALL.